Samsung's ATIV Book 9-Lite slots in somewhere between mainstream laptop and tablet on steroids, though at first glance it looks unassailably like an Ultrabook. Inside the eminently thin, snow white ATIV Book 9-Lite is a modestly powerful mobile quad-core AMD 'Kabini' processor that's clocked at 1.0-to-1.4GHz, 4GB of DDR3-1066 system memory and a speedy 128GB SSD for storage. The notebook features a pretty nice 13.3" touch screen display and runs the Windows 8 operating system. That's all well and good, but anyone casting their eyes on the ATIV Book 9-Lite for the first time will undoubtedly notice that it is thin.... like 3/4" thick-thin, and when they pick it up, marvel at how a complete computer system can weigh less than 3.5lbs!? Make no mistake about it, what makes Samsung's ATIV Book 9-Lite stand out from the crowd is primarily design, coupled with an attractive $829 sticker price. The Catch-22 is that as much as the ATIV Book 9-Lite looks and feels like a powerful Ultrabook, it is not. First off, the 4GB of system memory is fixed and non-upgradable; the DDR3 DRAM is literally soldered to the motherboard so there is no way to add additional memory into the ATIV Book 9-Lite system, which is decidedly un-Ultrabook like. The operating system is loaded onto a quick 128GB mSATA SSD, which is good, but graphics are delivered via the integrated AMD Radeon HD 8250 graphics core which is not the most powerful IGP out there... it's suitable for desktop applications though. 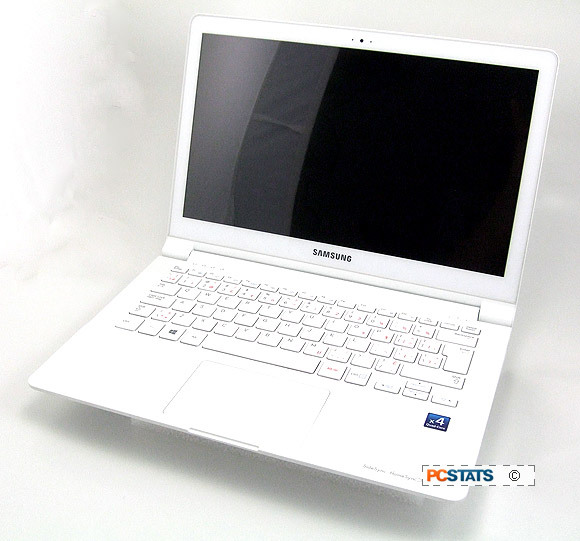 The processor is interesting; Samsung tech specs list only a "quad-core 1.4GHz chip." That's a tip off this isn't an Ultrabook - a branding invention by Intel. A little digging eventually reveals that the 1.4GHz quad core CPU is actually an AMD processor which has apparently been modified slightly by Samsung for this particular device. The AMD 'Kabini' A6-1450 APU is head and shoulders above weakling netbook chips, but still on par with an Intel Core i3. Again, not an Ultrabook-class processor. The ATIV Book 9-Lite is equipped with a multi-point 13.3" touch screen display, which is fantastic for the generation of users who grew up with smart phones. A touch screen means you can literally use your fingers on the screen to navigate web pages, type, open programs and Apps, same as you would on a tablet PC. 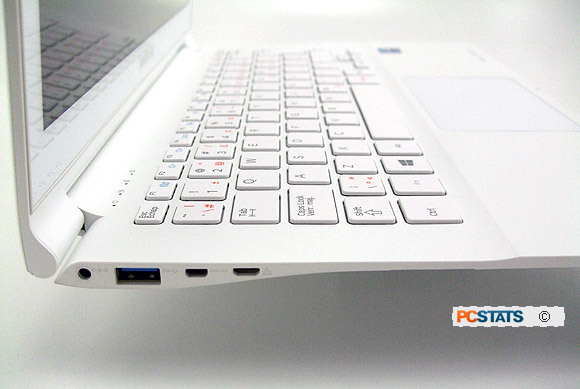 Older users will find themselves falling back to the good old keyboard and gestural touch pad, which are both implemented very well on the ATIV Book 9-Lite notebook. Design wise, Samsung's ATIV Book 9-Lite is wrapped in a marble-white plastic chassis that strongly reminds us of Apple's expensive Macbook Air. 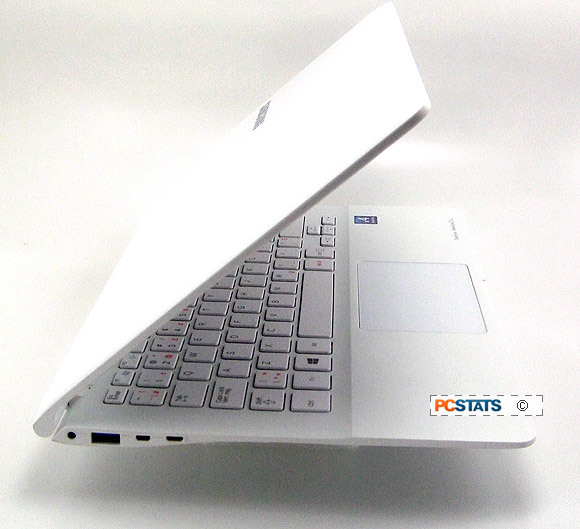 The ATIV Book 9-Lite NP915S3G-K01 notebook that PCSTATS tested in this review retails for $829CDN, the device also comes in black. Battery life is pegged at 5.5 hours. Included with the notebook is a quick start manual, recovery DVD, network dongle and AC power adaptor. Warranty coverage is 1 year. Ports: mini-VGA, micro HDMI, mini-LAN, 1/8" headphone jack, SD/SDHC/SDXC memory card slot, DC power. Flipping open the Samsung NP915S3G-K01's thin screen panel reveals a bright, expansive 13.3" LED backlit wide screen display connected to an impossibly thin chassis. There is a generously sized gestural touch pad and an 80-key tile keyboard. Dual display configurations are possible with this notebook, provided you spring for the necessary VGA dongle or have a micro-HDMI cable at the ready. 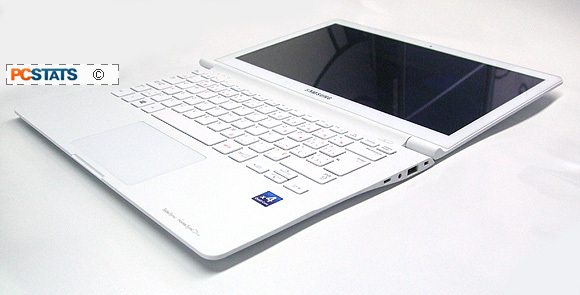 The ATIV Book 9-Lite NP915S3G-K01 includes integrated 802.11bgn WiFi with Bluetooth 4, one USB 3.0 and one USB 2.0 port. A physical network jack, SD memory card slot and headphone jack round out the ports. Samsung's ATIV Book 9-Lite weighs 3.5 lbs and its glass fiber plastic chassis is just under ~3/4" thick (0.69" / 17mm), measuring roughly 32cm by 22.5cm in size.. As you'd expect, a 720p HD webcam and microphone make Skyping easy, while a pair of miniscule 1.5W speakers hidden below the palm rests output decent sound. Other than the two USB ports, the only other data port is a combination 3-in-1 SDHC/SD/SDXC memory card reader for transferring photos from a camera or non-Bluetooth enabled device. Wired GbE LAN requires a dongle (included), so the majority of users will likely access the internet via the Samsung NP915S3G-K01 comprehensive built in 802.11abgn WiFi. Bluetooth 4.0 makes it easy to sync a smart phone or use an external bluetooth mouse/printer/keyboard. The Scrabble-tile keyboard is easy to type on, with 81-keys and a comfortable key-pitch. The 4.25" x 3" touch pad supports multi-finger gestural inputs and seamlessly integrated left/right click buttons. In keeping Samsung's current design ethic, the ATIV Book 9-Lite is offered in two variations, one black, the other which PCSTATS is testing today, white. We really like the stripped down design and absence of superfluous functions. 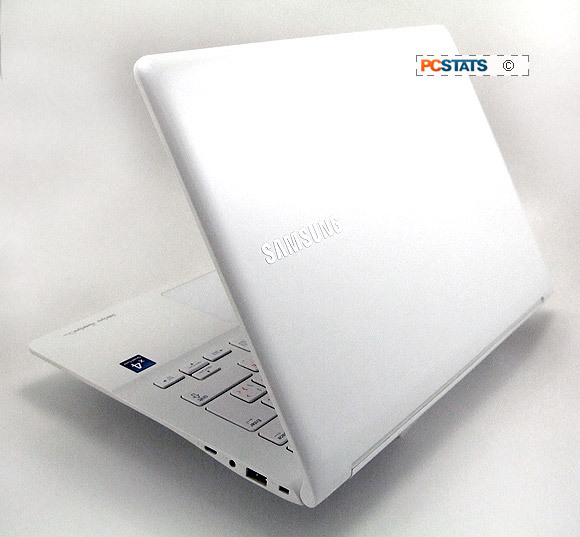 The ATIV Book 9-Lite has just four status indicators in the left corner and a single button for power to the right. Nice and simple. The notebook is eminently portable thanks to it's thinness and low mass. The chassis not made from magnesium or pressed aluminum, but plain old plastic and glass-fiber reinforced plastic. The body doesn't feel bendy like non-metal body notebooks, instead the fit and finish is tight, the tapering edges work to present a professional and streamlined appearance. Tablets work best laying flat on a table, the ATIV Book 9-Lite mirrors that by opening up nearly flat as well. From the back, nothing but a silver Samsung logo on a field of glossy white. You can't go wrong with a minimalist notebook! Next up, a closer look at the Samsung ATIV Book 9-Lite from all sides.